An obituary acts as a notice of death to friends and family of the deceased. It will typically include at least one photo, the loved one’s date and cause of death, a brief biography, funeral event details, surviving and predeceased family members, and special messages including instructions for charitable donations and gifts. Historically, this announcement of a death would happen via newspaper, where a family member would pay a newspaper several hundred dollars to publish an obituary and obituaries would be listed on an obituary section of the paper. However, on Ever Loved, you can write and publish an obituary online when you create a free online memorial website for a loved one. Writing an obituary is an act of love that can accomplish many things. At its core, an obituary is a declaration of loss, an acknowledgement of grief, and an expression of joy all-in-one. It celebrates the life of a loved one in a way that few other ways can. It can be used to portray the arch of a loved ones life – from birth, through life, and arriving at death – and provide a symbolic closure to a person’s story. 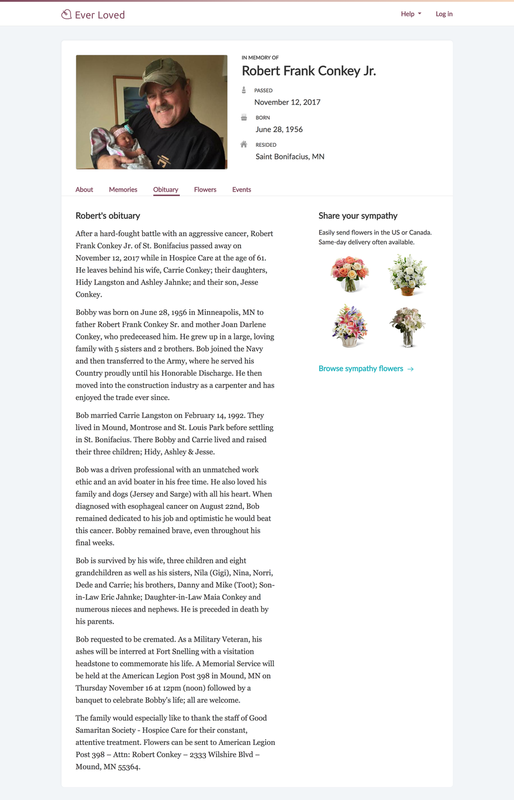 Beyond what an obituary can accomplish emotionally, an obituary also has logistic importance, as it acts as an official notice of death that lets the community know of a loss. It’s important to get obituary writing help since an obituary can help express what’s at times hard to say, especially while grieving. An obituary can help acknowledge and announce the death so that a community may come together, commemorate a life well lived, and provide a community with ways that they can participate in celebrating the life of a loved one. The best obituaries aren’t ones that are the most expensive to publish in a newspaper, rather obituaries that are well-written and are written from the heart are ones that stand out and stay with people forever. Interested in publishing an obituary for free? Create a memorial website for a loved one on Ever Loved to get started and add an obituary, funeral events, track RSVPs, add photos, and more.